About the author: L. A. Kornetsky is the author of two previous Gin & Tonic mysteries. She lives in New York City with two cats and a time-share dog, and also writes fantasy under the name Laura Anne Gilman. She welcomes visitors to www.lauraannegilman.net, @LAGilman and Facebook L-A-Kornetsky. 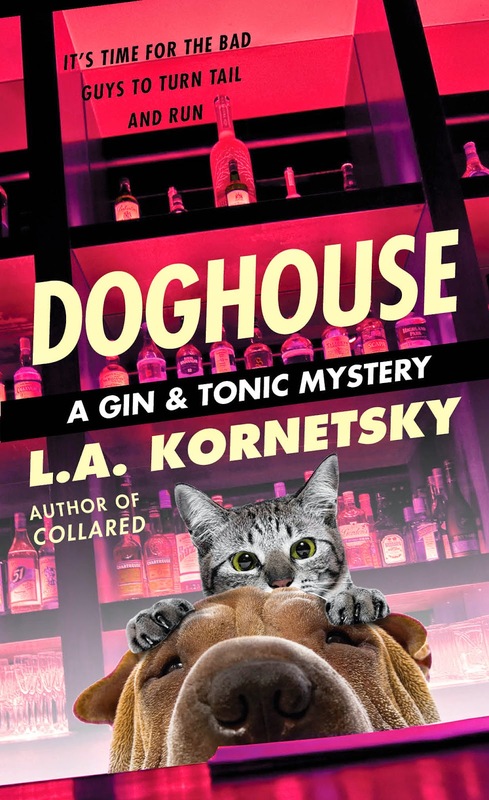 About the book: Amateur sleuths Ginny Mallard and Teddy Tonica and their furry partners prove in L.A. Kornetsky’s DOGHOUSE (Pocket Books; July 22, 2014; $7.99) that twelve legs are better than four when it comes to solving a risky new case in the third novel from the “entertaining” (Library Journal) Gin & Tonic mystery series. At her favorite Seattle bar, professional concierge Ginny Mallard can always count on a perfectly mixed gimlet and a friendly welcome for her shar-pei, Georgie, from resident cat, Penny. On this visit, Ginny gets an unexpected bonus. One of the regulars asks her and her sometime partner, bartender Teddy Tonica, to save an old friend who’s facing eviction. This is no simple landlord spat. Rumors abound of an underground dogfighting ring on the premises—a crime guaranteed to get Gin’s hackles up. Gin and Teddy want to believe the old man is innocent of all charges, thought a new piece of evidence suggests otherwise. Penny and Georgie keep their noses to the ground as they help their humans investigate the vicious animal rights case. But the truth is buried deep, and digging it up will unearth dangerous complications for owners and animals alike. This is the third book in the popular Gin & Tonic Mystery series, yet the first that I have had the opportunity to read, but that did not deter my enjoyment of the book in the least. Taking place in Seattle this isn't your typical "cozy"...I would define it instead as just a really enjoyable mystery. Bar manager Teddy Tonica and his cat Penny, and private concierge Ginny and her dog Georgie, team up once again to investigate a case for the bar's cook Seth. Seth's old boxing pal Deke (who has taken a few too many punches to the head) has been kicked out of his home by a landlord who is accusing him of running a dog fighting ring. Seth swears his friend is innocent, but Teddy isn't quite so sure when he checks out the house and finds a puppy hiding in the basement. Teddy and Ginny agree to take care of the pup until the case is solved, and as they become more and more involved they end up finding themselves in a good amount of doggie doo-doo. My favorite quote in the book: "If there's a crappy thing humanity can do to animals, assume someone's doing it." Teddy and Ginny are such refreshing characters; really good friends who aren't being thrown together romantically. Penny and Georgie help out in their own unique ways, and the short passages that reflect the investigation from their point of view were my favorite parts. Puppy Parsifal is a real scene stealer and little heartbreaker...I just wish we weren't left wondering who ends up adopting the little cutie pie! Maybe we'll find out in the next book, which I'm already looking forward to. I'm for Animal Welfare Week EVERY week! Okay, Melissa, you read it (and didn't say it was graphic), so I'm guessing I could handle it. To be honest, the thought of anyone hurting an animal is enough to make me want to do some graphic things...to them! Sharing this via Twitter and FB! Looks like a great read, and it's definitely on my TBR list! Sounds like a series I need to give a try. Love the book cover! Sounds like a great read. I didn’t know about Animal Welfare Week. Wonder how that passed me by. Oh yeah, TW. You don’t have to enter me since I can’t read and TW won’t. Thanks for stopping by!! Mom is so busy that times I can hardly visit some days! Mom lobes to read!! Nothing like a rescue pet to make a house a home. Wouldn't have any other animal. I'm looking forward to reading this book. Ii'd love to read about Penny and Georgie. Please enter me in your contest. We loved her comment about how some papers are a connection to your life and cannot be thrown out. Too much meaning and specialness there!